Rotating shafts present a NVH challenge. Speed fluctuations create torsional vibration that can damage downstream components or create uncomfortable noise conditions. To resolve concerns manufacturers turn to Vibratech TVD for our expert torsional vibration analysis, design integration, engineering and demanding product validation. ISO 9001:2015 Design & Development certified. 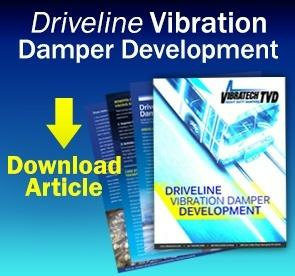 In each of these examples Vibratech TVD developed a tuned viscous damper specific to the driveline application with the goal of improving durability and overall quality. A narrow frequency band coverage with a viscous damper is achieved through our ability to fine tune and hold precision machining tolerances in combination with proprietary silicone selection. Tuned for optimum protection in a narrow frequency band of a single order. Lasts the life of the driveline. Vibratech TVD was approached by a major manufacturer of mass transit buses to analyze, test, engineer and manufacture viscous dampers to eliminate driveline torsional vibrations causing unacceptable NVH throughout the cabin. Light aircraft engine manufacturer sought Vibratech TVD to improve durability of current starter shaft viscous damper. Vibratech TVD analyzed, then designed and developed a proprietary non-metallic internal bearing. New viscous damper improved quality and successfully passed FAA validation testing. Vibratech TVD was awarded production contract from manufacturer. The Future of Driveline Vibration Dampers.